Cytomid (Flutamide) is used as a treatment for men suffering from prostate cancer. Doctors may recommend taking this drug alongside radiation therapy or other medications. This drug is known as an anti-androgen. It works by blocking the effects of male hormones (called androgens). Cytomid (Flutamide) is used as a treatment for men suffering from prostate cancer. Doctors may recommend taking this drug alongside radiation therapy or other medications. This drug is known as an anti-androgen. It works by blocking the effects of male hormones (called androgens). As the cancer needs the male hormones to spread and grow, by blocking the effects of the hormone, the growth of the cancer may be slowed down. It has been suggested that this drug may be suitable for treating hair loss, however this has yet to be conclusively proven. 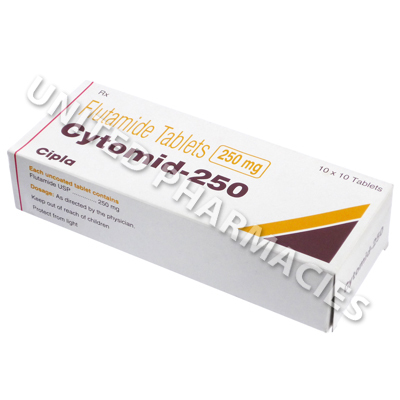 Cytomid (Flutamide) comes in the form of tablets. A medical consultation is required, so that your doctor can prescribe the correct dosage. It is likely that your doctor will tell you to take this drug 3 times per day (every 8 hours). However, the dosage prescribed is based on the patient's medical condition and response to treatment. You must only take the amount prescribed to you. Do not abruptly discontinue treatment with this drug unless your doctor tells you to, as doing so may cause the cancer to spread more rapidly. If any of these side effects persist or become severe, you should immediately consult your doctor. There is also a risk of more serious side effects, such as severe damage of the liver. You must immediately see your doctor if you notice pain in the abdomen, severe fatigue, flu symptoms, yellowing of the eyes or skin, severe vomiting or any other symptoms of liver damage. If you smoke or suffer from blood diseases such as glucose-6-phosphate dehydrogenase (also known as G-6-PD) deficiency or a condition known as hemoglobin M disease, you must inform your doctor prior to commencing treatment with this drug. This drug is only prescribed for treating men. Women who are pregnant or who may become pregnant must never handle the tablets, as there is a slight risk of the medication being absorbed through the skin. Always use Cytomid (Flutamide) as you have been prescribed by your doctor. Never self-medicate or change your dosage without first consulting your doctor. The correct dosage can vary depending on your health, medical history, and the severity of the condition being treated.